A surprisingly smart comedy with seth rogen showing that he is a natural talent when it comes to humor. 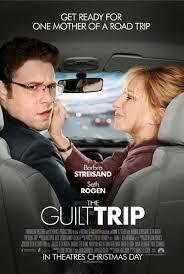 A funny and somewhat creative movie that works because of the relationship between rogen and streisand. If it was only about an annoying mother, this movie would have been boring and dumb. But instead, the film is about her son and what he is going through in his life. And Seth Rogen knows how to play dialogue for humor. He reacts to his mom as if he is on the road with a crazy person, and the result is pretty great. it helps that there is also a smart plot involving a quest to find someone from the past. On top of that, there’s also a very strong subplot about Rogen’s character Andrew, trying to pitch a new product that he has invested lots of money into. The movie treats both of these plots as if they are absolutely crucial and the main storyline of the film, and doesn’t hold back on either one of them. The result is a very good movie, filled with humor and creativity. The Guilt Trip happens to be a good movie, even if it wasn’t marketed to look like one. The trailer makes it look like this is a movie about an annoying Jewish mother. Who wants to see that? We don’t go to the movies to get bothered or to laugh at how annoying someone is, and if we do, then it generally tends to be a pretty dumb movie (there are some comedic actors who have built careers on these kinds of films, but their movies tend to be pretty simple and dumb.) luckily, The Guilt Trip is about the son as much as it is about the mother, and Seth Rogen here, shows that he really does have great comedic talent. Rogen is a fine actor. That’s not because of his acting ability (I don’t expect him to take a serious role anytime soon, or to win an Oscar ever), but because of his comedic timing. He understands what’s funny and how to write and deliver humorous lines in the ways that will elicit the most laughs. Credit Judd Apatow for that, giving Rogen a start on the TV show freaks and geeks, and then on Apatow’s next show, undeclared. Apatow started making movies, and put Rogen in them first as side players (the forty year old virgin), and then as the star (Knocked Up, Rogen’s breakout film.) so one might say that everything Seth Rogen learned about comedy, he learned from Judd Apatow. And boy has it played off. Rogen is not only an actor, but also a writer (Superbad) and director (this is the end.) he’s a guy who knows comedy, and he really proves that with the guilt trip, a movie where the whole thing is on his and Barbara Streisand shoulders. And let’s be honest, Streisand hasn’t made a movie in years, other than her appearances in the meet the parents sequels. So this is all Rogen, and the fact that it works is all him too. It isn’t Streisand being annoying that is funny, but the way that Rogen reacts to her. At the start of the movie, we meet Andrew Brewster (Rogen), as he listens to messages from his mom. They are overly nurturing messages that are all the more ridiculous because of how many of them she has left for him. Think the scene in swingers where Favreau leaves one message after the next on a girl’s machine, without ever realizing what he’s doing. After the messages bit, we watch Andrew go into a pitch meeting, where he tries to present his new product of cleaning fluid to a retail store. They are less than interested. Andrew’s product and the way he pitches it will become a major part of this movie, and it’s a fantastic subplot. The main plot, of course, is between Andrew and his mother, Joyce (Streisand), and the movie doesn’t take very long to get to her. Andrew shows up at her house and right away she is trying to show him off to her friends, inviting them all over for dinner, despite Andrew asking his mother not to do that. She explains to her friends what Andrew does, and she is completely wrong. Watching Rogen react to this and tell her how wrong she is happens to be a lot of fun. She thinks he’s a door-to-door salesman, and he has to explain to her that things aren’t sold that way anymore. The big moment comes when the two of them have some time alone to talk one night, and Joyce reveals to Andrew that there was a man in her life, before she met his father. They are talking about relationships and how the both of them are single, and Andrew is curious why his mother doesn’t try. He even gets her to go to a singles mixer, where she is not warm to any of the men who show interest in her. So now, back at the house, he sits her down for a talk and she tells him about this other man. That other man meant a lot to Joyce, to the point where she was dating both him and Andrew’s father at the same time. And when Andrew’s father asked Joyce to marry him, she went and spoke to the other man (also named Andrew), about it first. He told her she should marry this guy and so she did, and never saw the young man that she was in love with again. Andrew can’t believe all this. He teaches whom he was named after, and that his mother had a whole scandalous life before and even while she met his father. Now Andrew sets out on a mission to reunite his mother with this other man. He wants to get them together and to see if maybe he can set his mother up. That sparks the road trip that the two of them go on, which is the basic plot of the movie. Andrew has a number of presentations to give, while traveling cross-country, and the last stop will be in San Francisco where this man lives. He asks his mother to come along on the trip with him. Their road trip turns out to be a lot of fun. I love that we get lots of scenes of Andrew presenting his product, and really get into the way that he’s presenting it, what he thinks is so great about it, and why the companies he presents to aren’t really interested. Joyce accompanies him to some of these presentations, and with one of them, she even acts as a co presenter. That scene turns out to be hilarious. We follow the story of Andrew and his presentations as if it were a competition movie, all the way to the big game at the end. But of course the real plot of the film is about Joyce and this man who they are going to see, and the movie delivers on that storyline as well. Along the way, there are stop offs that also contribute to the story, including one at a hotel and bar where Joyce goes out and gets drunk with the locals, and another where she participates in a steak eating competition. We’ve seen scenes like this before (The Great Outdoors), but in The Guilt Trip, it feels detailed and fresh. The story and the humor both really work in this movie. And one of the best things about it is how much of a surprise the movie is. This film looks like it would be such a throw away picture based on a cheap joke, and yet it has tons of hidden tricks up its sleeve to give it something original. It turns out to be a pretty good movie after all.